I first came up with Viccckkky (for the sake of simplicity, Vicky) while I was an assistant editor at Random magazine, back in 2011. At the time I was putting finishing touches to my first graphic novel. I even performed him at the Golden Kela Awards of 2011 (check at 00:27), bringing in the guests. This alive was the character for me. Vicky is the archetype bad boy of 90’s “college” films. 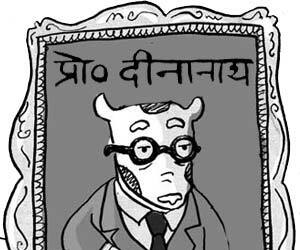 Whenever I draw this character, all I hear is the voice of Mohnish Bahl. So much so that I tried animating a Viccckkky over his voice. really bad 1 hour job. For this comic I went out of my way to research 90’s films. I remembered them, but to seem them again, and pausing after every 1 minute is fun. Want to see my research notes? will upload in a few days! Since 2011, I pitched this idea to anyone who could publish a book or an animated film. And guess what, everybody said no. Sometimes I don’t understand why people say no to these ideas. Maybe it’s me, maybe it’s Maybelline. 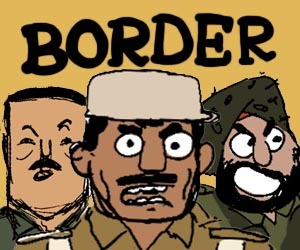 I was holding on till Nishant Jain – cartoonist and owner of the webcomic – Rajma Chawal Ink told me about this BOLLYWOOD VILLAINS PROJECT trying show Bollywood villains in a positive light. Vicky fits right in. So I did mine, while he worked on his comic about MOGAMBO and the pursuit of happyness. Phew. Vicky has many adventures. Only if they can happen. Eisner Awards 2018 की तैयारी शुरू कर दो … अगली बार तुम ही भारत का नाम रोशन करोगे ! The Ghamand Breaker! Bah Gawd he’s broken her in two, someone stop this match! hello hello, have edited the flashback bits. seems better now. clear the cache and see! that was fast! and way improved readability!